Marshaling a comedian’s eye for satire and a writer’s ear for language, James takes his audience on a breath-taking, non-stop roller coaster ride, cutting a wide swath through contemporary culture with his razor-sharp ribald wit, uncompromising standards and unique, poetically honed delivery. 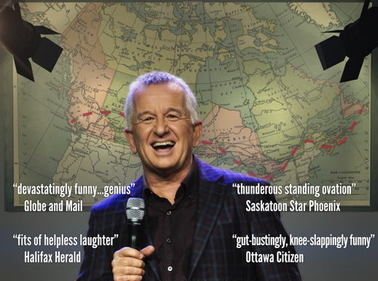 With eight critically acclaimed one-hour comedy specials under his belt, plus five seasons starring in his own series, “The Ron James Show”, Canada’s #1 road warrior is back doing what he does best: delivering laughs face to face and coast to coast ... a full throttle Pedal To The Metal ride! Reserved seating tickets for Ron James - Pedal To The Metal are $55.00 (tax and facility fees included), go on sale Friday, March 10 and are available from the box offices listed below. Other locations are Sechelt June 8, Maple Ridge June 9, Prince George Playhouse June 10-11 and Cranbrook June 17. Ticket information can be found in Nelson at Capitol Theatre Box Office 250-352-6363 and Charles Bailey Theatre Box Office 250-368-9669.